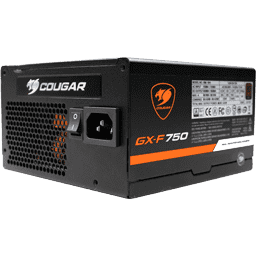 Cougar recently introduced the GX-F line consisting of three members with capacities ranging from 550–750 W. All are fully modular and 80 PLUS Gold certified. They are also certified by Cybenetics with ETA-A (88-91% efficiency), LAMBDA-A- (25-30 dB[A], GX-F-550), and LAMBDA-Standard++ (30-35 dB[A]), GX-F650/750) ratings. The chassis in those new Cougar units is compact enough with 15 cm of depth, and its external design looks nice. Internally, the platform is provided by HEC/Compucase, and according to our sources, it is a new design developed for Cougar specifically. 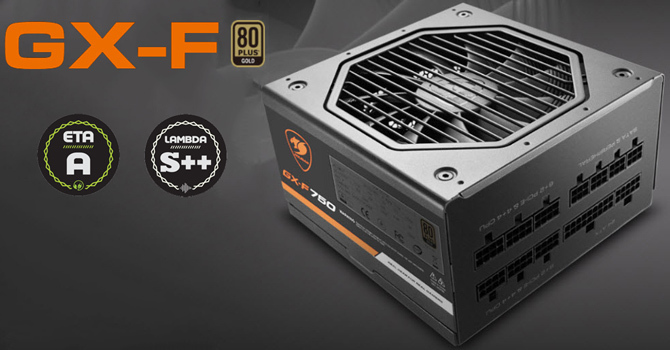 In this review, we will focus on the strongest GX-F member with 750 W maximum power output. The GX-F750 is currently sold for €100 at Caseking.de, one of the largest online shops (and distributors) in Europe, which is €20 less than the highly popular Corsair RM750x, and the Seasonic Focus Plus Gold with a similar capacity has about the same price tag (€104), while the Bitfenix Whisper M 750 W is ten euros away since it currently goes for €110. This means that the Cougar GX-F750 faces strong competition in Bitfenix's offer and even stronger competition from Seasonic's offer, so it will have to prove that it can meet both those PSUs face-on in our testing session.